Saskatoon makes their final visit of the regular season to Swift Current for game 7 of an 8-game series with the Broncos. The Blades have points in 8 straight games (6-0-2-0) and haven’t lost on the road since January 5th. 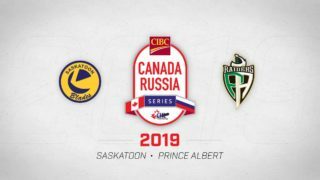 Saskatoon will continue to try and create distance from the Moose Jaw Warriors in the East Division, who currently trail the Blades by 6 points with 3 games in hand. 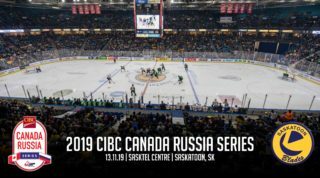 Meanwhile, the Broncos will look to snap a 4 game skid after earning a single point last night in Brandon in a 3-2 shootout loss where they were outshot 56-22. Dawson Davidson (10) and Kyle Crnkovic (6) each had a goal and 2 assists in Wednesday in a 6-1 win at home over Moose Jaw. 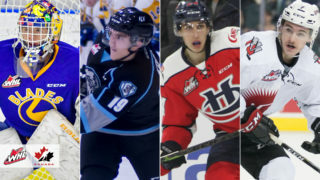 Chase Wouters (10), Ryan Hughes (20), Max Gerlach (32), and Brandon Schuldhaus (5) also scored for Saskatoon… Nolan Maier made 19 saves for his 26th win of the season. 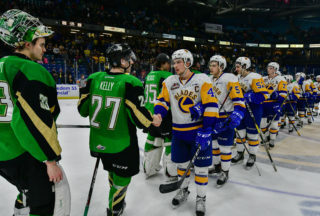 Saskatoon leads the 8-game series 5-0-1-0, outscoring the Broncos 33-13 in those 6 games. Tonight marks the 5th time the two teams will meet since December 30th. Kirby Dach, Max Gerlach, and Gary Haden all have 5 goals in the series… Nolan Maier has all 5 Blades’ wins in goal. A trio of Broncos are tied for 4 points each in the series… captain Tanner Nagel leads the scoring with 3 goals. Saskatoon is 8/27 (29.6%) on the power play in the series and 3/16 (81.3%) on the penalty kill. Kyle Crnkovic is coming a 3-point night on Wednesday, the 2nd of his young career. The 16-year-old winger now has 15 points in his last 16 outings. Dawson Davidson had 3 points on Wednesday as well, extending his point streak to a career high 11 games (2G-15A). 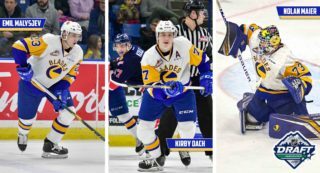 Kirby Dach and Ryan Hughes both have 5 points in their two games. 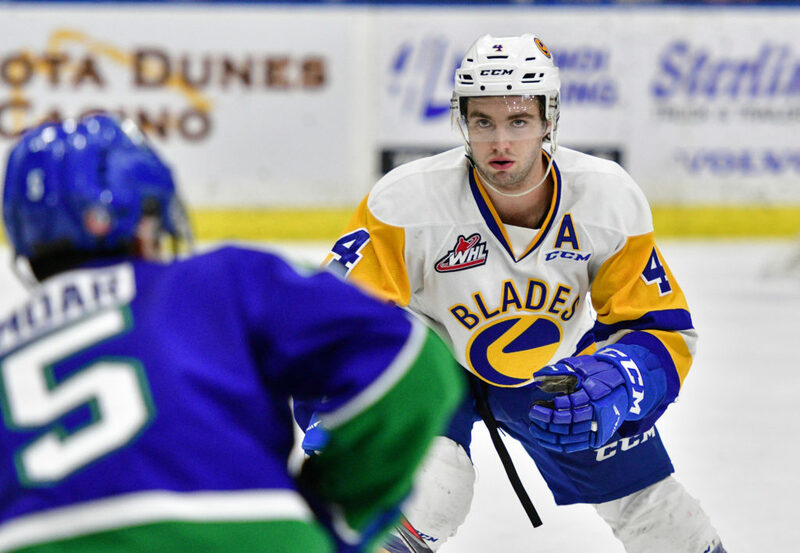 The Blades are back on home ice at SaskTel Centre tomorrow afternoon to host the Brandon Wheat Kings at 4:00pm. It’s a Mosaic Family Sunday, so be sure to bring your skates and hit the ice with the players after the game!